On the Shimoga Thirthahalli road, around 14 km from Shimoga is the Sakrebailu Elephant Camp. The camp houses several captive elephants. Sakrebailu is an eco-tourism center. The elephants in these camps are trained by skilled Mahouts. The camp is located on the banks of the River Tunga. Many wild elephants residing in the forest also visit the camp to enjoy snacks and to play in the backwaters. These wild elephants return to their forests and do not stay in the camp. 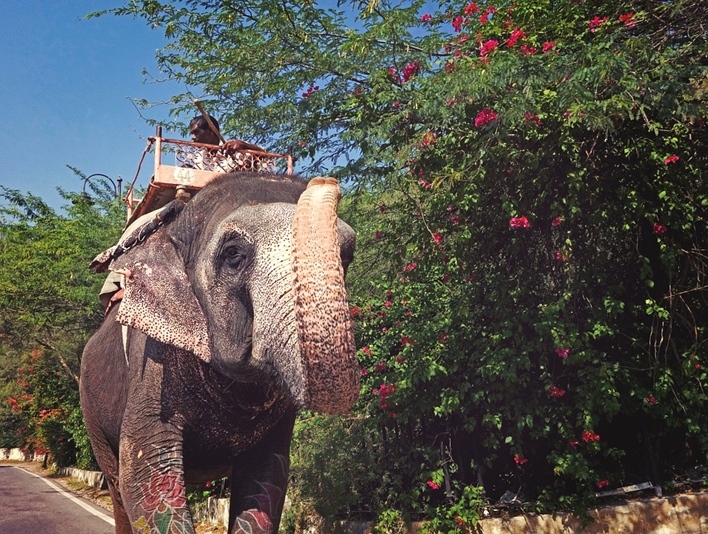 Sakrebailu is an ideal place to have fun with kids who can enjoy a day with these elephants. 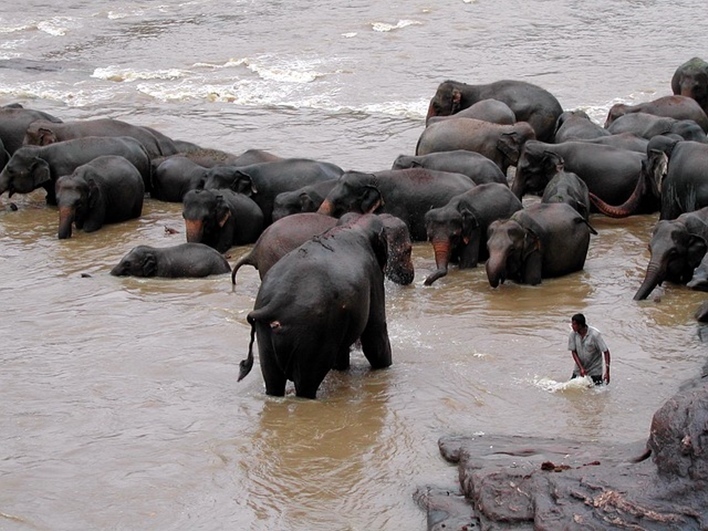 Karnataka State Government has taken the initiative to protect these elephants and let them live in the wilderness. The eco-tourism center facilitates tourists as well as local people to visit the camp to witness the tuskers in proximity. The baby elephants are a fascinating watch. The tourists can watch the ablutions of elephants where they spray water on each other and get scrubbed by the Mahouts. Entry Fee: Rs 30 for Indian visitors and Rs 100 for Immigrants. The Sakrabailu elephant camp is a center that facilitates to the preserve the elephants and tames them. The elephants are captured and brought to the camp to be tamed. The camp has herds of elephants and baby elephants living. The wild ones are captured and then disciplined. The camp ensures that the elephants are free from any kind of epidemics. Proper care and nutrition are provided to the elephants to keep them healthy. Uncontrollable elephants are brought into the camp to be tamed. Being the elephant training center, tourists can interact with the elephants quite close. The elephant’s interacting session takes about 2-3 hours and is very well crafted. Tourists get a unique time with these giant tuskers. To watch the elephant bathing, tourists can reach early in the morning. Kids can really have a gala time in the camp. Especially the elephant interaction would be the one way to get to know the giant animals. Elephant bathing can be witnessed if you visit before 9 in the morning. Visitors can feed the elephant with the special food prepared by the Mahouts. No outside food is allowed. Only the food prepared by the Kavadis who are the elephant attendants can be fed. Visitors can watch the elephants being fed and even the training activities. Visitors are not allowed to use flash while taking pictures as it might provoke the animals. Elephant riding is allowed in the camp. The ride will take you to the camp and will be a pleasurable trip to cherish. Trekking in the camp is allowed. Tourists can enjoy a walk around the picturesque location and even witness the wilderness of the forests. Shimoga is well connected to major places in Karnataka. Sakrabailu Elephant camp is around 14 km from Shimoga and 288km from Bangalore. Several buses ply from various places in Karnataka to Shimoga or via Shimoga. Hence Shimoga is well connected. From Shimoga, tourists can hire a taxi to reach Sakrabailu Elephant Camp. Nearest railway station is Shimoga. Major stations in Karnataka are well connected to Shimoga via rail. Tourists can travel to Shimoga from any part of Karnataka. From Shimoga railway station, tourist can hire a taxi or even take up local buses to reach Sakrabailu Elephant camp. Mangalore Airport is around 165 km from Shimoga. From the airport, private vehicles and even taxis are available.